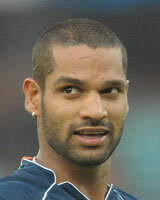 Shikhar Dhawan respectfully requests that he be considered for the Indian cricket team. You’re a batter who’s reached the age of twenty-seven, scoring freely and often in the minor leagues, and yet you’ve been prevented from entering the majors because the guy you’d be replacing is a slugger of such renown that to drop him seems impossible, even though his form is obviously slipping. But then the impossible happens: the slugger gets dropped and you’re given your first game. What do you do? Take it cautiously? Ease in gently? Lower expectations? Well, if you’re Shikhar Dhawan of India, you come out and score the fastest century (100 runs) on debut in the history of cricket; you then score the most runs ever by an Indian player on debut; and at the end of the day’s play you find yourself 186 not out and with plenty of opportunity to break more records. You could not make a more compelling case for future inclusion. You could not send a more compelling signal to the man you replaced, the genial bulldozer Virender Sehwag, to hang up his boots. And you could not offer a more compelling example for the Indian selectors to pay a little more attention to the young guns rather than coddle the old stalwarts. It’s no secret (or shame) that India has for some time been choosing players on box-office appeal as opposed to current form: V. V. S. Laxman (now retired) was classy and elegant, and stayed perhaps two years beyond his sell-by date; Sehwag was another, who clearly can no longer rely on phenomenal hand–eye coordination to make up for his increasing ossification at the crease and in the field. The spinner Harbhajan Singh, who’s recently completed his hundredth Test match for India, has effectively been pushed out by Ravichandran Ashwin and Ravindra Jadeja, both of whom can bat better than Harbhajan, and simply are more of a threat with the ball. The elephant in the room is Sachin Tendulkar—currently immoveable at number four in the batting order, and clearly not the player he once was. Tendulkar has played 196 Test matches (one of the many records he holds). Are we all—including the Little Master—just waiting for him to reach 200? And is there another Dhawan waiting in the wings to show just how little the Great Man will be missed? This entry was posted in Cricket, India, Test Cricket and tagged Harbhajan Singh, Ravichandran Ashwin, Ravindra Jadeja, Sachin Tendulkar, Shikhar Dhawan, V. V. S. Laxman, Virender Sehwag. Bookmark the permalink.